It was a cloudier picture than I had expected as we drove west over the Dirrie More to Braemore Junction, then round to the end of Loch a’Bhraoin. To the west An Teallach was still hiding in the cloud. But as we walked down the track to the loch there were signs that the promised weather was on it’s way! The moon was still clear in the sky, lingering above Sgurr Dubh, the pinnacled eastern outlier of Fisherfield’s Mullach Coire Mhic Fhearchair. It was perfectly still and quiet. With the early morning glow of the sunrise catching the hills around the loch and a perfect reflection on the water it was a stunning scene. We made steady progress from here, striking off the path for the bridge that isn’t on the OS maps and on up the steep western slopes of Meall a’ Chrasgaidh. As we climbed the snow cover gradually increased and in shaded areas it was bullet hard. With B2 boots making minimal impression on the surface I even got to practice my step cutting skills! Nearing the point where the gradient begins to slacken a little near the top we also saw a fox scampering away from us across the snow. A very rare sight and a definite highlight of the day. I’ve only seen a fox up high in the hills once before and that was back in 2011! We reached the summit around 11am. By now we were into the glorious conditions that would persist for the remainder of the day and the views were immense. From the distant peaks of Knoydart far to the south, to the equally distant Ben Hope in the north, there was a sea of snow capped peaks in all directions. We had a snack, then headed on our way. The walking was a breeze on lovely consolidated snow, it felt warm in the sun and there was hardly a breath of wind. I had to take off several layers and gladly welcomed the offer of sun cream – suprisingly for a ginger Scotsman, it is something I always seem to forget. We made our way over to the Munro Top of Carn na Criche and then to Sgurr Mor, with a wee bit of a bumslide on the short downhill to the col. Climbing up Sgurr Mor is steep. 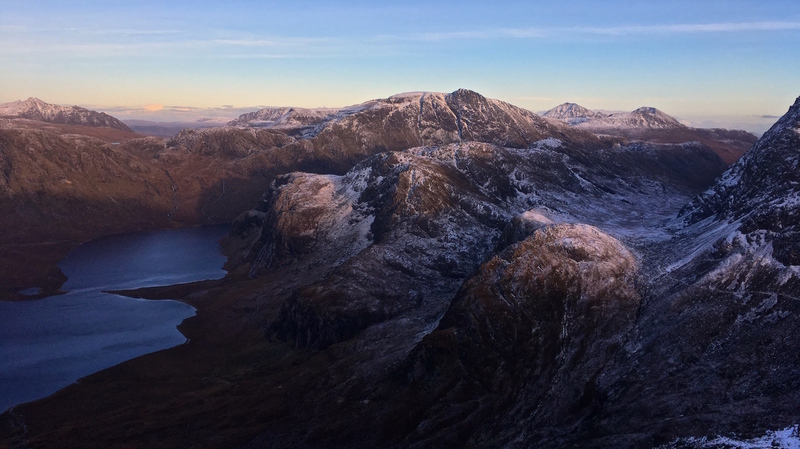 It is the highest peak in the Northern Highlands and it really makes you work for it! Climbing up into the shade on previously windward slopes we soon hit on some very icy snow. Despite subconciously knowing it would be icy and being aware from past experience that it’s always preferable to equip yourself appropriately before getting onto more technical ground, the snow conditions caught us both off guard, and we had to hastily dig ourselves some ledges and don the crampons. After that, lesson learnt, it was a steady ascent to the summit with yet more breathtaking views. Often the views from these hills are dominated by An Teallach, with it’s pinnacled crest and vast eastern corries pulling all the attention out to the west. Today however, it was Sgurr nan Clach Geala that stole the show! It’s eastern face reared up from the depths of Coire Mor with heavily corniced ridges converging on the icy summit. A few whisps of cloud brushed it’s slopes, adding a little atmospherics to the scene. On the day it looked like the perfect mountain! And that was where we headed next. After a quick calculation to make sure we still had a enough time for it we headed back down from where we’d come (with a couple of broken spectres thrown in along the way!) and followed the rim of Coire Mor round to the base of Sgurr nan Clach Geala’s northeast ridge. The ridge was mostly in the shade, so crampons were welcome once more and we had to take a fairly cautious line to avoid the enormous cornices overhanging the eastern side of the ridge. We reached the top a little before 3pm and wandered around the rim of the coire a bit further to take in the views – which were even better than when I was here in early November after the first snowfalls of the winter. The summit cairn and trigpoint were almost invisible beneath the snow and there was was a big drift of snow above them over the coire edge. We decided not to go and investigate! After taking in the view for a while we ploughed back down the ridge we’d climbed and down to the broad bealach at it’s base. The glen leading away west from these hills to Loch a’ Bhraoin is a place we’d both walked through in the past. It can be pretty boggy and wet. To avoid the worst of this and to stay high in the sunshine we decided to finish our day with a return over Meall a’ Chrasgaidh, the first Munro of the day. We summited in just over 15 minutes from the col and had one last break on the top to savour the views, the silence and enjoy the evening light as the sun was starting to go down. From there it was a steady decent back to the bridge and along the track back to the car, getting back just before dark, with the last of the dayight setting An Teallach in perfect silhouette. A great end to one of the best days I’ve ever had in the hills!